To think when I was the same age as my daughters I had never used the internet! It was when I was in one of my final years at primary school that our classroom got one computer! It was a huge thing with terrible graphics but it was so exciting. Now my daughters have all the latest tech readily available to them at home and school, it’s brilliant. I used to have to nip to the local library for books on school topics but the answers for them are a mere google on the tablet away. The internet has brought us such amazing things and to have all that knowledge at our finger tips is fantastic but there is a dark side to the internet. A side I never want my daughters to see, a side I don’t even want to see myself. It is important for us as adults to keep up with technology, to fully understand the devices our children are using and keep them safe online. Parental controls; Any decent device will have parental control options you can activate. 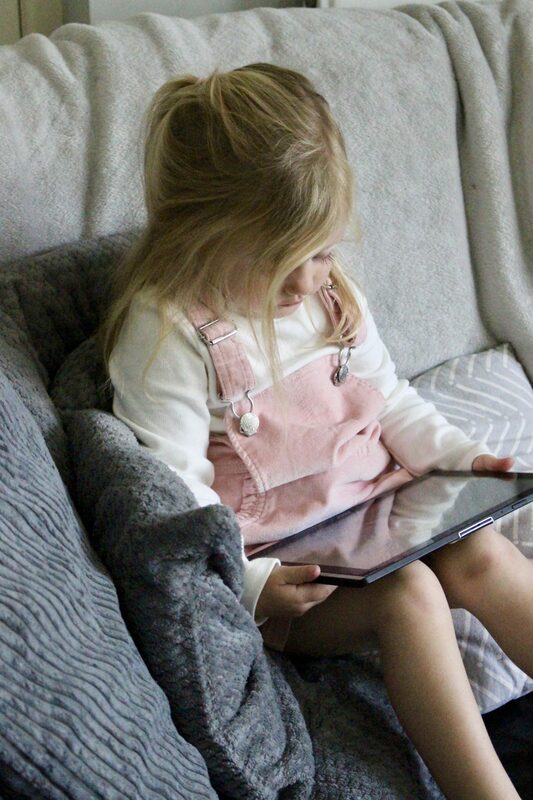 I think before giving your child their new tablet this Christmas it is a good idea to go in get to grips with it and set it up so it is safe from the off. Talking to your children; aside from the obvious threats online cyberbullying is a real issue. My children are way to young for social media but it will be upon me before I know it. Talking to children and making it clear what is acceptable and what is not online is so important. The last thing you would want is your child being upset by comments made against them online. Equally important is to make your own children aware that a harmless comment they could make may hurt someones else’s feelings and have real consequences. This article on ao.co.uk about children on social media is really interesting. Keep access; If a password is applied to a device make sure you know it and make them aware you can check in at any time. It’s not about not trusting your children but so much goes on in children’s lives that we don’t now about, it is imperative to keep a close eye and make sure if you do spot anything worrying it can be nipped in the bud asap. The internet is a wonderful thing; my only concern is that half the time adults don’t know how to use it in a responsible way so what hope do our children have. I didn’t grow up with the internet readily available to me so it is tough knowing the best ways to deal with our children and their internet access but I really feel communication and boundaries are key and will see our children safe online.